Jamaica experienced a deadly conflict between two political parties in 1976. In one side there was The People’s National Party (PNP) and on the other side there was the Jamaican Labour Party (JLP). While improvising the lyrics of Jamming, Marley stopped and invited the leaders from the two opposing parties to the stage. 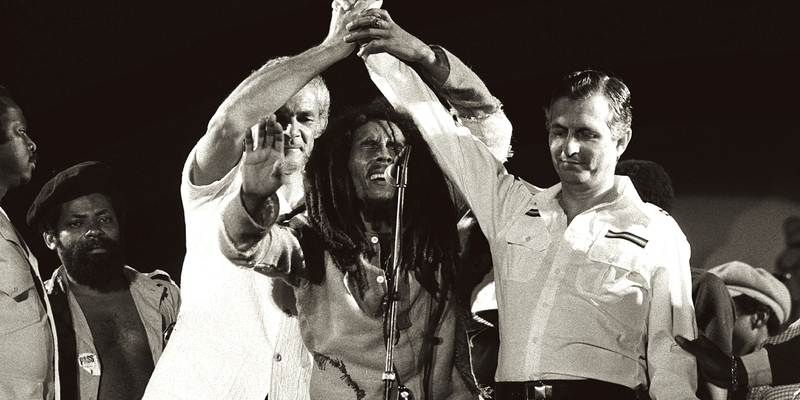 Michael Manley and Edward Seaga had their hands glued together and for a magical short moment, Jamaica was united. Love prevailed. Bob Marley’s speech is once again extremely appropriate due to the latest events that took place in the United States. Is there a final destination? I am a warrior of freedom and unity. Below, lyrics from the song War by the beautiful brown hero, Bob Marley.